Paul Jordan in action on the Dafabet Devitt Kawasaki at the Macau Grand Prix, where he finished in 14th place on his debut. Paul Jordan says he sometimes has to pinch himself as the Magherafelt man reflected on his debut appearance at the Macau Motorcycle Grand Prix. Jordan finished in a solid 14th place behind Skerries rider Michael Sweeney in the 52nd running of the legendary race, which was halted with three laps to go following a crash involving Ben Wylie and Phil Crowe. Fortunately, neither rider sustained serious injuries in the incident, which happened at Fisherman’s Bend. Senior TT winner Peter Hickman clinched his third victory at Macau in the race last Saturday from his Aspire-Ho by Bathams Racing team-mate Michael Rutter, who was riding the trick Honda RCV213V-S.
Jordan, who made the long journey to southern China for the first time with his Dafabet Devitt Kawasaki team-mate and fellow Macau newcomer, Dominic Herbertson, said the race was much tougher than he had anticipated. “I knew it would be tough over there but I didn’t think it was going to be as tough as it was, but really the humidity and the temperature were the biggest factors of all,” he said. “I did a lot of homework on Macau before I went and spent a lot of time watching on-board footage and playing the game to be fair, so that helped and I never really lost my way. “I was happy enough with the finish and I had a good race with ‘Micko’ until it was stopped. “Sometimes I take for granted how lucky I am to be living my childhood dream, and what a dream it is,” Jordan added. 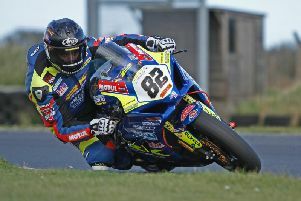 Jordan and Herbertson made their debuts for the RC Express Racing team at the Ulster Grand Prix in August after Ivan Lintin was ruled out following a serious crash at the Southern 100 in July. Lintin was caught up in the fatal incident that sadly claimed the life of Yorkshire rider James Cowton. He sustained serious injuries, but the Lincolnshire man is now recovering. Jordan’s performances at the Ulster Grand Prix no doubt boosted his prospects for next season, while the Northern Ireland rider also excelled on his debut at the Classic TT in August, where he was in contention for the rostrum in the Superbike race on the Mistral Kawasaki until a problem on the final lap forced him out. Another fine effort on his debut at Macau will also have done his prospects no harm as the Ulster rider already begins to look ahead to a big year in 2019.